How Do You Feel About Your Face? 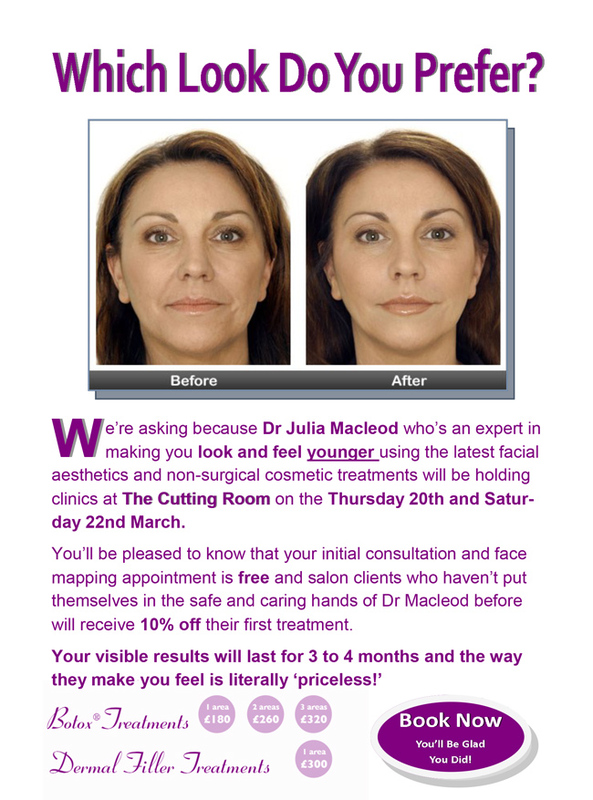 We’re asking because Dr Julia Macleod who’s an expert in making you look and feel younger using the latest facial aesthetics and non-surgical cosmetic treatments will be holding clinics at The Cutting Room on the Thursday 22nd May. You’ll be pleased to know that your initial consultation and face mapping appointment is free and salon clients who haven’t put themselves in the safe and caring hands of Dr Macleod before will receive 10% off their first treatment. Your visible results will last for 3 to 4 months and the way they make you feel is literally ‘priceless’ so call the salon on 01738634666 … You’ll Be Glad You Did!